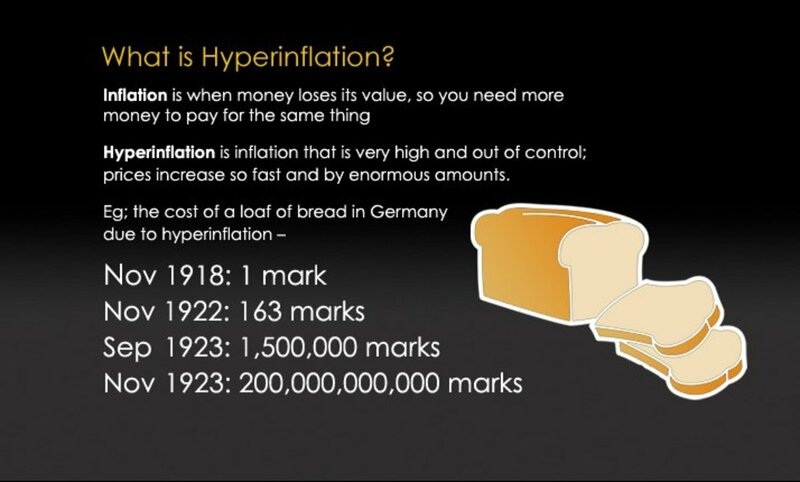 German Hyperinflation 1923: What is it and What Lessons Can Be Learned? Before World War 2 and after their defeat in the Great War, the Germans suffered the terrible effects of hyperinflation. It is in no doubt that the effects of this helped Hitler in his rise to evil. The poverty of the people led to starvation, desperation and a search for a scapegoat. The over population could be resolved and the finger of blame pointed to the new scapegoats in Germany. These scapegoats were the Jews. Built from the snowball effect from hyperinflation, in understanding this concept, you will understand the concept of how this terrible war of blood and suffering effected so many in so little a time. Understanding hyperinflation in the example of the second world war, helps us identify similar themes today. We must learn from this example in order to avoid the same thing happening again. Hyper inflation is where money is worth less, items are more expensive and as a result the Government print more money. This is because Germany was in debt after their demise in World War 1. They had to repay a big loan as a National debt. This is not disastrous for all Germans. A section of the population actually benefits from hyperinflation. People like Farmers, for example, can sell their produce for as much as they choose which emphasis's more profitability. They can also eat what they can’t sell which lessens waste. Another example of the section of German society who benefits from hyperinflation were people who are debt re-payers. Why is this? Because they would have taken out a greater amount of money before Germany found itself in a hyperinflation state. Therefore, the money they pay back would be valued much less than the original past loan. Most of Germany, however, suffered from the effects of hyperinflation. It particularly affected the old and the working classes. People who were on pensions were on a fixed income, which had no chance of increasing, because these were set prior to the hyperinflation period. The working classes, of course, did have an increase in salaries during this period, but this did not rise a quickly as hyperinflation. As a result of hyperinflation, Germany experienced a countrywide strike. As a contributing factor, the French and the Belgium’s invaded the Ruhr because Germany could not pay back the war reparations (the national debt and fines associated with non-payment). Furthermore, as an attempt to recover costs, asset stripping took place at Ruhr in the form of stripping the land of raw materials. On balance, hyperinflation was a disaster for Germany as it eventually resulted in war and poverty to the people. It is not surprising, therefore, that the people revolted and an uprising took place which followed the Munich put ch. Looking for scapegoats, within a society dogged with poverty and National debt, make for ripe social conditions of unrest. In these times during history, there is invarably a change in social structures. They break down which leaves openings for new eras. In the case of the prilimariaries to the second world war in Germany, the economic climate seemed to be begging for a leader who was going to evoke change. Money is a representation of the amount of gold in each country, equal within that country's central bank. If you imagine a glass half full of juice representing the amount of gold and you fill the remaining glass with water, you effectively dilute the juice. Creating more money, therefore, dilutes the worth of the money. The effect of this encourages businesses to put up prices. In order to combat this, the government prints more money. This dilutes the currency further, lessening the value of money in real terms. The more dilution, the more business puts up prices and the more governments have to print more money. 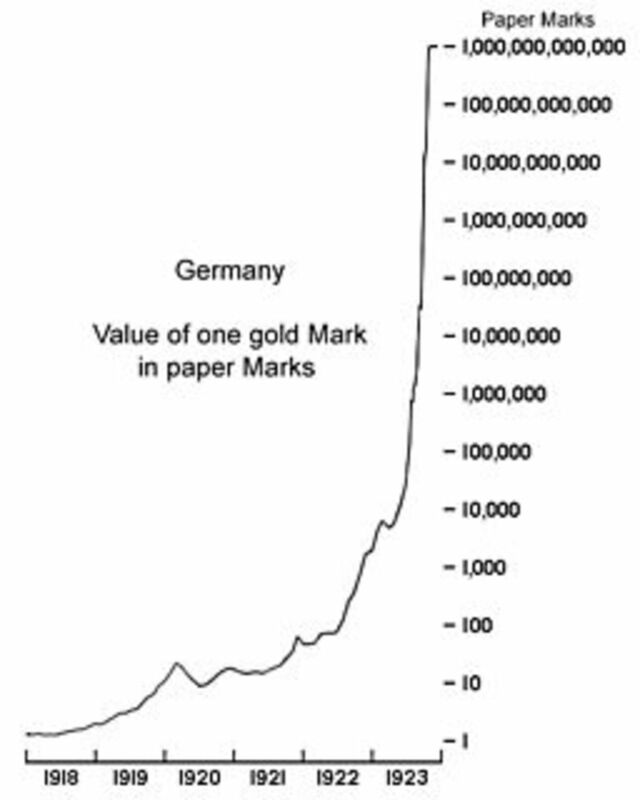 Eventually this makes money worthless, as seen in Germany in 1923. 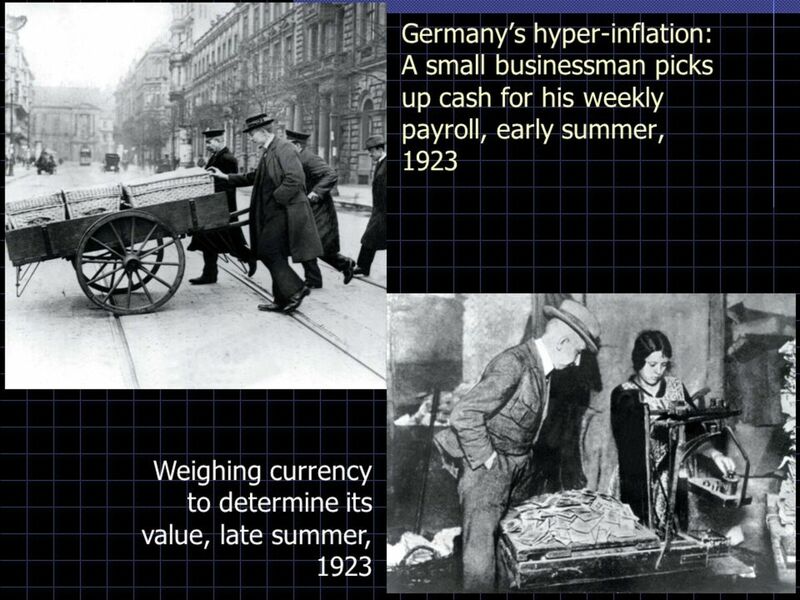 So what caused hyperinflation in Germany? 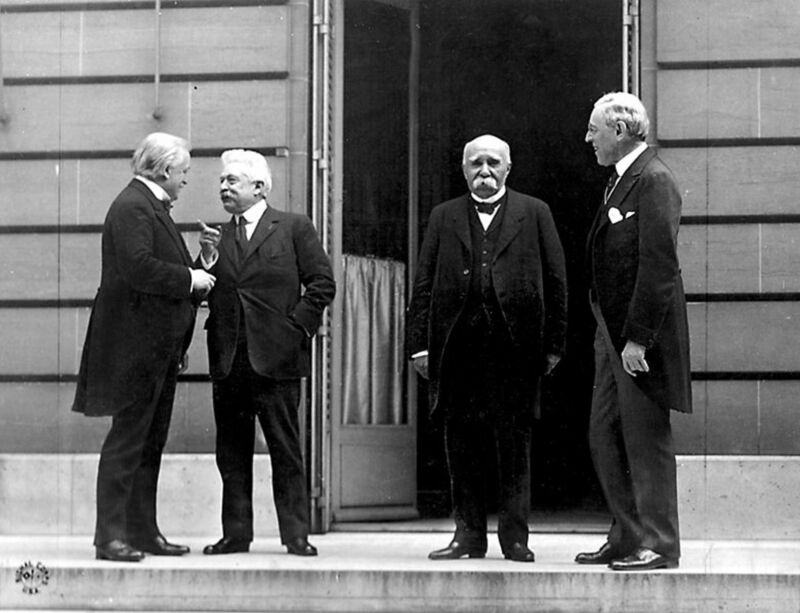 They owed money to their allies for damages done during the 1914 world war under an agreement known as 'The Treaty of Versailles'. Germany couldn't afford to pay and as a result, the French marched into Ruhr, an industrial area. As a way to avoid paying the French, the Germans were encouraged to Strike. This is known as 'Passive Resistance'. The government was broke, so to overcome this, they just printed more money which diluted the value of their currency further. Exasperating things, wages had to be increased and resulted in printing even more money which eventually rendered the currency worthless. This is hyperinflation. People starved as wages could not keep up with food prices. However, those that were in debt could easily pay off their loans as wages increased. To protect their wealth, big business bought smaller ones and put all their money in assets, rather than saving. Some workers were paid in 'stuff' rather than cash. As hyperinflation continued, people lost their jobs and there was huge unemployment because trade and business became impossible. The people of Germany blamed the government for signing the treaty in the first place. The German government became vulnerable and because the people were desperate, Hitler seemed to provide hope and change and was voted in to implement this. Through jealousy, blame and scapegoating, it was the Jews that got this as they seemed to be thriving whilst the German people suffered. Does this sound familiar? Let's learn from history and not allow hyperinflation to rear it's ugly head, again! That leader was Hitler. The scapegoats were the Jews. 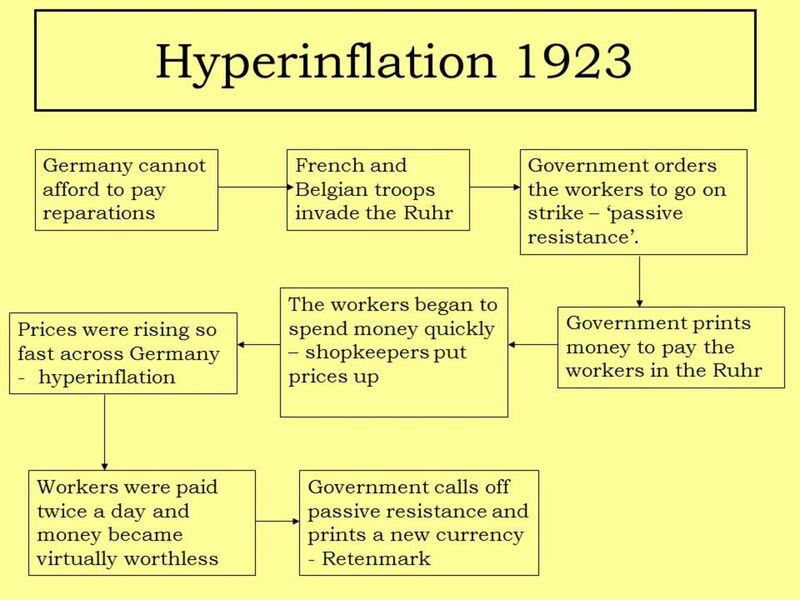 In understanding the lead up to such a catastrophic war, we have to understand the historic dynamics - hyperinflation in Germany was one of those. I have found this great series on DVD which demonstrates this in an informative way, whilst entertaining. It is a drama series starring Robert Carlyle, Stockard Channing and Jena Malone and can easily be purchased on Amazon for a modest price. Hitler The Rise Of Evil on DVD was first introduced to me by my son who was studying GCSE History. The class was shown a small part of this DVD as part of their essay assignment on hyperinflation causes leading up to World War 2 in Germany. They were only shown the relevant material. Unfortunately my son's appetite was whetted and it resulted in us purchasing the DVD. From this, both of us have learned more about the world dynamics at this time of history in a very easy format. The whole family participated and, I must say we all gave it a thumbs up for great content, information and enjoyment! So, was hyperinflation a disaster for all Germans prior to world war two? Taking everything in consideration, and what transpired as a result of hyperinflation, the answer would be an resounding yes. Blood-shed is not a moral replacement for money! What Have You Learned - Just for Fun! Hyperinflation: Since the 2008 banking crisis, more money has been printed to prop up the world's economy. Are the problems associated with hyperinflation happening again? Maybe. There are some signs: Brexit, Trump, the downfall of the EU and monetary effects are leading to hunger, unemployment and devaluation of currencies around the world. ... Germany signed a contract and didn't fulfill their side of the deal. "the French and the Belgium’s invaded the Ruhr because Germany could not pay back the war reparations"
So there we go, the allies started the war! Hi K9 - This really is a great series. It filled in some blanks for me and gave me a good understanding of what happened. I can see how he raised to evil, when he attracted like minds. Good information and a well recommended DVD series on Hitlers Germany (I adore Stockard Channing). Thanks for presenting a wonderful hub. 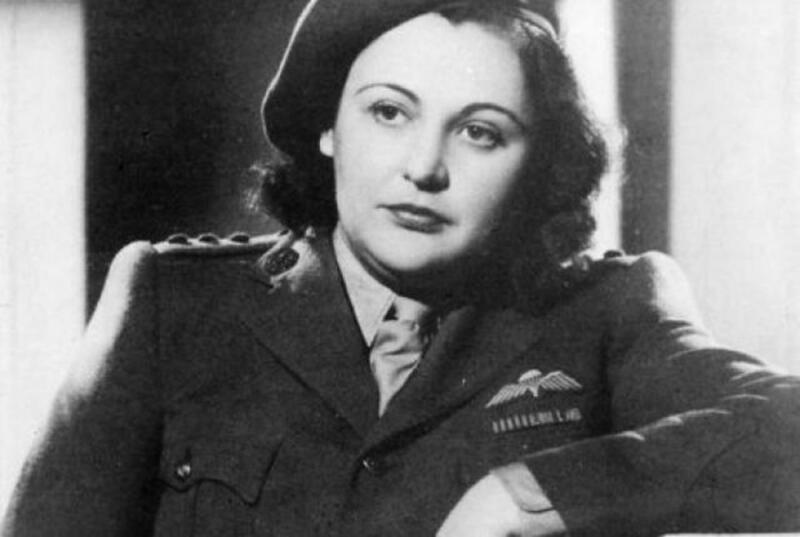 miss_jkim - No, I dont live in Germany, neither am I German - I am British and have a great interest in the history of the time. Interesting hub; history teaches us that all great societies go through such problems. The Egyptian society was bled dry with the building of so many great pyramids and temples. The Roman Empire fell, partly, because of their thirst for power and the desire to rule the world. There are incidences in France and England, where the Royalty taxed the people far beyond what was even reasonable. This caused uprisings, dissention and civil unrest, to the point of, the lopping off of the queen of France's head. Then you have this very vivid and horrible block of history in Germany with the rise of the Third Riche. 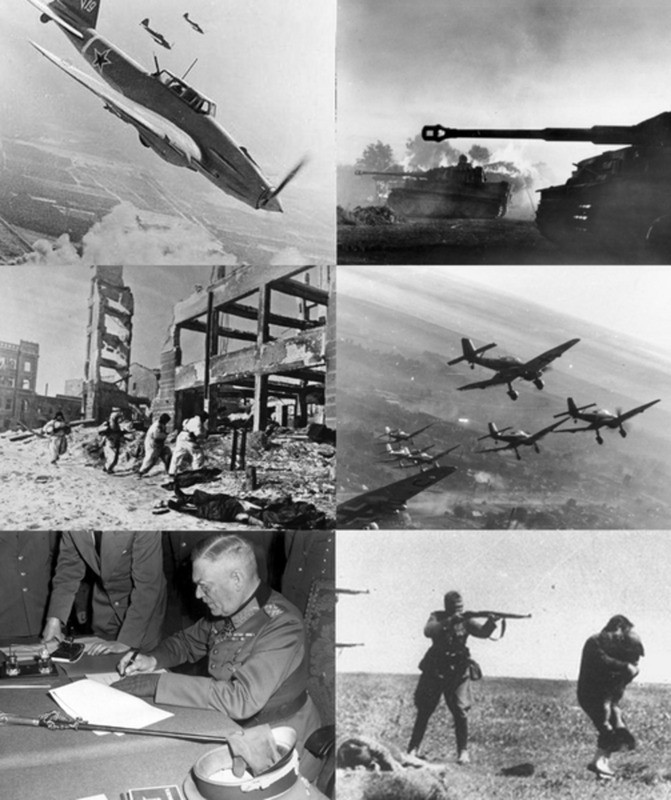 Moving on into the cold war era and the Soviet Union's devastating pillaging of countries like Romania, Hungry, Czechoslovakia, Yugoslavia, East Germany, and Poland. It all boils down to one thing, GREED! Whether it's greed for money or power, it's still the same. I only hope that in this dark hour of global financial difficulty, we will take a good hard look at these history lessons and learn. Unfortunately, history also shows how little man learns from the past and that history repeats itself. By the way, are you a German and do you live in Germany? happyboomernurse - cause and effect, you are right. We need to think in terms of goodness so as we can strive for a better world. Give me a cause for peace! rui paiva - like attracts like and Hitler attracted what he sent out, causing us to learn a great deal from a tragic situation. This was a powerful, thought provoking article. I agree with your response to Jed and it reminded me of an equation that Jack Canfield speaks about. E + R = O Event+Response=Outcome. We can not choose the events that happen around us, but our response will determine the outcome. We can choose to believe in and create abundance even in these trying times and we can stand up and speak out when we see evil things happening. As per the opening quote in the trailer, "The only thing necessary for evil to flourish is for good men to do nothing." Great hub. The historical and economic information given is very good. In times of great crisis there is always someone who enjoys too much or that builds empires from one day to another, but for most it is a hell. Jed - we all need to advocate that this time around, the world will be filled with abundance and that there will be only good that comes from this crisis. I've heard, inflation is a pickpocket but deflation is a crook with a ski mask and a crowbar. Enjoying my front-row seat for this global financial crisis, as it's centered in America this time around. The Banksters want to inflate their way out of debt, while the Bondsters want deflation. With any luck, there won't be another Hitler.